This condition is satisfied everywhere in the - plane. Hence, the Lagrange points are all stable to small displacements parallel to the -axis. It thus remains to investigate their stability to small displacements lying within the - plane. Figure: The solid, dashed, and dotted curves show as a function of at , , and Lagrange points, respectively. 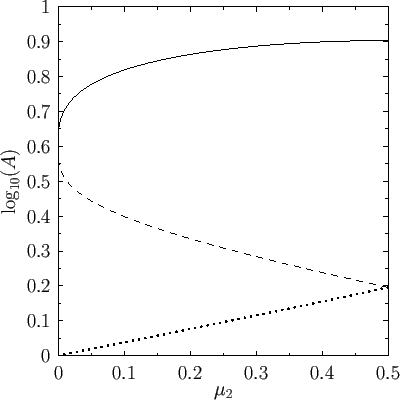 Figure 9.13 shows calculated at the three co-linear Lagrange points as a function of , for all allowed values of this parameter (i.e., ). It can be seen that is always greater than unity for all three points. Hence, we conclude that the co-linear Lagrange points, , , and , are intrinsically unstable equilibrium points in the co-rotating frame. Figure: Positions of the Trojan asteroids (small circles) and Jupiter (large circle) projected onto ecliptic plane (viewed from north) at MJD 55600. The -axis is directed toward vernal equinox. Raw data from JPL Small-Body Database. 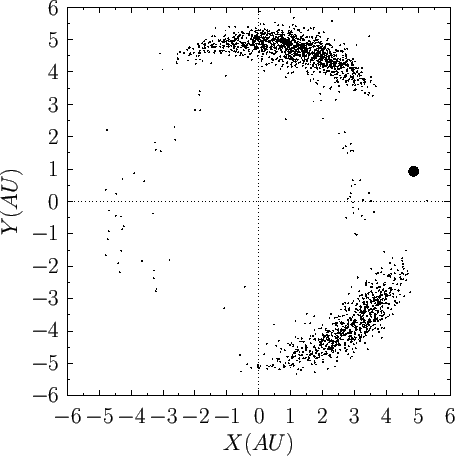 Figure: Positions of the Trojan asteroids (small circles) and Jupiter (large circle) at MJD 55600. is normal distance from the ecliptic plane. is the difference in ecliptic longitude between the asteroids and Jupiter. Raw data from JPL Small-Body Database. 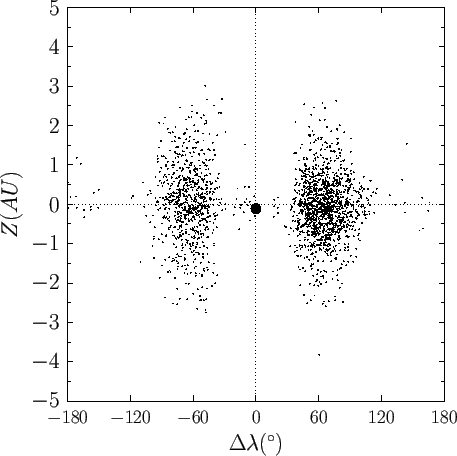 We thus conclude that the and Lagrange points are stable equilibrium points, in the co-rotating frame, provided that mass is less than about percent of mass . If this is the case then mass can orbit around these points indefinitely. In the inertial frame, the mass will share the orbit of mass about mass , but it will stay approximately ahead of mass if it is orbiting the point, or behind if it is orbiting the point. (See Figure 9.12.) This type of behavior has been observed in the solar system. For instance, there is a subclass of asteroids, known as the Trojan asteroids, that are trapped in the vicinity of the and points of the Sun-Jupiter system [which easily satisfies the stability criterion in Equation (9.89)], and consequently share Jupiter's orbit around the Sun, staying approximately ahead of and behind, Jupiter, respectively. These asteroids are shown in Figures 9.14 and 9.15. The Sun-Jupiter system is not the only dynamical system in the solar system that possess Trojan asteroids trapped in the vicinity of its and points. In fact, the Sun-Neptune system has eight known Trojan asteroids, the Sun-Mars system has four, and the Sun-Earth system has one (designated 2010 TK7) trapped at the point. The and points of the Sun-Earth system are also observed to trap clouds of interplanetary dust.